It’s been a busy fortnight here at SHARE with Schools! We’ve been out on trips to Cathays High, Woodlands High, and Michaelston Community College. Michaelston and Woodlands are part of the Ely and Caerau Federation, aka Westfed. Last week myself, a handful of volunteers, and 40 secondary school pupils went on an adventure back in time. Back to the dreary times of World War 1 Cardiff. I must admit I was nervous. To me World War 1 is depressing – muddy boots, muddy bodies, and muddled tactics that caused both. 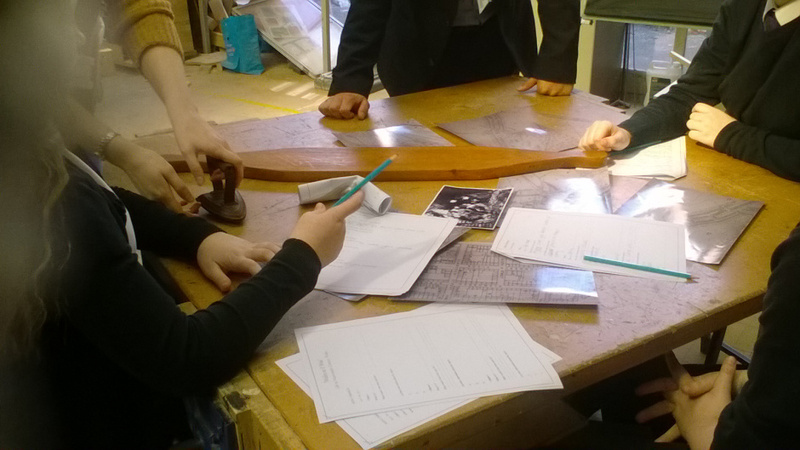 But through the workshop, and the stories of real life Cardiffians, World War 1 came to life before our eyes. The volunteers were absolutely incredible in this task, guiding the pupils through the artefacts in order to get at their underlying stories. From the Belgian ‘alien’ to the soldier on the Egyptian front, the pupils got to grips with the heritage of their area. Walking around the room and hearing stories from the pupil’s own families made this both incredibly relevant and exciting – tales of Grandfathers who were conscripted from Cathays where the school was, and Grandmothers who had shown the pupil’s letters from the front. So a big thank you goes out to the volunteers who achieved this monumental task – bringing the past to life for the benefit of those in the present. It went so well that even the Ofsted inspector was impressed! On Tuesday SHARE with schools returned to Woodlands, to present 2 workshops. 19th Century Welsh life, thanks to artefacts provided by St Fagan’s natural history museum and Cardiff University conservation department. Also a unique workshop was presented by a group of students from Cardiff University’s Heritage and Communications module on Welsh myths and Legends. Both workshops went very well and lead to some wonderful discussions of the difference between life in the 19th century and life today as well lots of artefact handling and examination. And finally a big thank you to Stephanie Hall and Caitlin Fleming who delivered at Michaelston yesterday with co-ordinators Kate Tinson and Kostas Trimmis and Dr Dave Wyatt. By all accounts it was an inspiring visit to Michaelston Community College in Ely, with 3 workshops delivered (2 x Life in 19th century Wales 1x Cardiff in WW1) to over 70 pupils in 3 hours. One of the school teachers said that “all the lessons seemed to go really well, the best I’ve seen our pupils engaged for a long time”!